We have amazing teachers with experience in a variety of styles of yoga. Each of our teachers are Yoga Alliance certified and lead classes to suit each individual's needs. Take a look- there is a style and teacher to fit everyone! 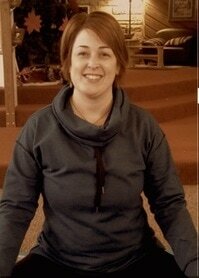 Kris is Owner of RedBloom Yoga & Center for Community Wellness and runs Kula Yoga Outreach in Mt. Pleasant, MI. While Kris has practiced yoga on and off for most of her life, she began a definitive yoga practice in 1998. She is certified through Yogafit to teach general yoga as well as yoga for seniors, children, and pre/post-natal, and has received her certification in Ascension/Aerial yoga through Shanti School of Yoga. She started teaching yoga, pilates, and other fitness classes for adults and children while living in Orlando, Florida in 2008. After moving to central Michigan, Kris taught yoga in fitness centers and yoga studios before starting Kula Yoga Outreach, a yoga community based in Mount Pleasant. She currently organizes Kula Yoga and is excited to expand that sense of community and love of healthy living into RedBloom Yoga and RedBloom Center for Community Wellness. Kris tries to always find the joy and humor in a practice and encourages yogis practicing with her to do the same. Before starting down the yoga path, Kris worked as a music therapist for 10 years in a variety of settings. She is an avid reader and knitter with two mini-yogis (daughters) and a husband at home. Kris’ philosophy is simple- everybody can do yoga, regardless of shape, size, or experience. And everyone should have the chance to experience yoga in their own bodies. In her personal practice Kris likes to spend much of her time upside down. ​Mel's relationship with yoga began in 2002, while in Midwifery school in New Mexico. Three years later, while practicing Midwifery in the same city, she was surprised to find there were no prenatal yoga classes. Pregnant herself at the time, she decided to get her yoga instructor certification with a specialty in prenatal (pregnancy) yoga. This naturally led to yoga with babies, since many women wanted to continue after birth. When she moved back home to Mt. Pleasant, she again found no yoga classes specifically for pregnant women and their babies. She has been privileged to provide this service in other yoga studios in Mt. Pleasant, and now leads prenatal, postnatal, baby & me, and much more at RedBloom. She am also excited to expand our community by offering education and support to women during pregnancy, early motherhood, menopause, and those dealing with issues related to being a woman. This is her passion and calling! ​Mel says, " Yoga has become a way of life for me, and I am glad to be able to share the many benefits with others. It extends way beyond our mats, impacting our lives each day." Carlin’s yogic path began long before she ever stepped foot into a studio. Having been a former gymnast, as well as a coach, she went on to pursue a bachelors of science in health fitness from CMU. Carlin was soon drawn toward a more natural approach to health, and so decided to pursue a degree from the Naturopathic Institute of Therapies and Education. This holistic approach to health inevitably led her to yoga. After Carlin experienced her first group yoga session she was hooked. She eventually went on to earn her 200 hour yoga teacher certification, and then decided to focus on the vinyasa style of yoga. Carlin has an aptitude for inversions and believes that the combination of breath and movement in a yoga practice are priceless attributes to a healthy body, mind, and spirit. It all started when Jalene, at a young age, developed a passion for acrobatics. In high school she was a competitive cheerleading champion, rugby fullback and rocket cheerleading coach. Her first job after high school was a children's gymnastics teacher. At the age of 20, after a healing crisis, she tried the practice of yoga hoping to improve her health, maintain her flexibility and increase her agility. Not only did it achieve all three but the subtleties of the practice slowly empowered her to explore the depths of her Self. With time she began to recognize and unravel the habitual patterns that caused her suffering. Anchoring within her a contagious passion to share the healing practice of yoga with others and learn more each and every day. Jalene Howard completed a yoga leadership program and permaculture training program December 2015. Receiving a 200hr yoga alliance certification in the Akhanda tradition and a 72hr Permaculture Design Certificate at The Yoga Forest in San Marcos La Laguna, Guatemala. After returning to the central Michigan area, she broadened her knowledge base and developed the unique voice of her teaching style: Lunar Warrior Yoga. Blending her vast knowledge of astrology, Akhanda yoga, and alternative healing methods to provide a unique experience of strategically moving healing energy through the body on the mat. Amy has been practicing yoga since 2003. She is a native of Michigan: her yoga roots in Grand Rapids with an early focus on Anusara style. In 2012 she had the opportunity to move to southern California where she refocused her practice and pursued her teacher certification. She moved back to Michigan in 2015 to come back to her roots and share her experiences. Amy has explored multiple disciplines including Ashtanga, Anusara, Kundalini, and Vinyasa Flow with a variety of teachers. She found her home in alignment-focused practice and went on to receive her 200 hour yoga teacher certification from the Shraddhaa School of Yoga in Temecula, California. Amy’s teaching style is thoughtful and clear. She moves her students in a mindful and safe way with an ever-present focus on body alignment. She is always up for a bit of laughter and fun in the class. There is no need to make it harder than it needs to be. Thankfully teacher friends encouraged her back and helped heal that physical and emotional trauma. She has since been practicing and using yoga to better understand the subtle energies of the body as well as heal injuries and trauma. Erin is a strong believer in self-healing and is committed to navigating the territory of achieving balance with essential breath work. She completed a 200hr teacher training with Dr. Justine Lemos and Scott Miller in 2014 through Western Yoga College and recently completed a 24hr aerial teacher training in October of 2017. Her classes are both grounding and expanding as she guides through the breath-body connection during yoga asanas. Crina Tarasi is a Blue-belt Nia instructor, in love with the practice of dancing in joy. Crina discovered and fell in love with Nia 10 years ago. In the busyness of life, Nia took her out of her mind, and made her rediscover her body and the joy of movement. Dancing gently, playfully or forcefully with the music, Nia is the gift she offers to herself, and she is thrilled to share the gift of joy of movement with others. ​Dance with Crina at RedBloom! I was first introduced to yoga, like many people of a certain generation, when I saw “Lilias Yoga and You” on PBS. I think that was in late 1970 or early 1971. I loved it, I loved Lilias Folan, her funky pink leotard with the racing stripe and her odd tri-fold mat were not quite as exciting as the NASA's Apollo moon missions, but they were a window into a world I found fascinating. I tuned in with great regularity and followed her cues to various asanas on the carpet in front of the TV, it's so easy when your 10. Good times, for sure. I didn't stick with it, though, kids find other things to do. Nonetheless, a seed was planted. Fast forward three plus decades; I was searching for an alternative path to recovery, the standard fair was sort of useful, but did not fully resonate with my perspective, eventually I found an alternative path through the teachings of Siddhartha Guatama, the Buddha. I found a way to end the suffering that craving, obsession, and attachment bring. Looking to deepen my mindfulness practices, I rediscovered my love for yoga. Time spent on the yoga mat greatly enhanced time spent on the meditation cushion, of course, that's is precisely what it's designed to do! I continued to explore how linking body, breath, and mind could be of use to people in need of recovery, first becoming a certified recovery coach and then taking the plunge to get my 200 hour, yoga teacher training at the Yoga Maya Institute with my teacher Trevor Chaitanya PritamHari Eller, learning yogic philosophy, asana practice, and ayurveda. I continue to explore how mindfulness practices and yoga can release us from stress, anxiety, trauma, and the suffering that addiction brings.